In Psalm 80 the poet Assaf offers a prayer for redemption by way of a beautiful analogy comparing Am Yisrael to a vineyard. He depicts the Jewish people as a vine that God brought from <?xml:namespace prefix = st1 ns = "urn:schemas-microsoft-com:office:smarttags" />Egypt and planted in Canaan after clearing the ground – meaning, after driving away the Canaanite peoples. The vine grew and expanded and became an enormous, fruitful vineyard, until God ultimately "breached its fence" (verse 13), allowing foreigners and animals to come and feast on its produce. Ultimately, it was even set on fire – clearly a metaphoric reference to the destruction of the Temple. Three times in this chapter we find the refrain (though with slight variation), "God, return us; shine Your face and we shall be saved" (verses 4, 8 and 20). Assaf asks that God restore the Jewish nation to the glory and peaceful existence it once knew, that He once again tend lovingly and devotedly to His "vineyard" and help it grow large and bountiful as it had in the past. 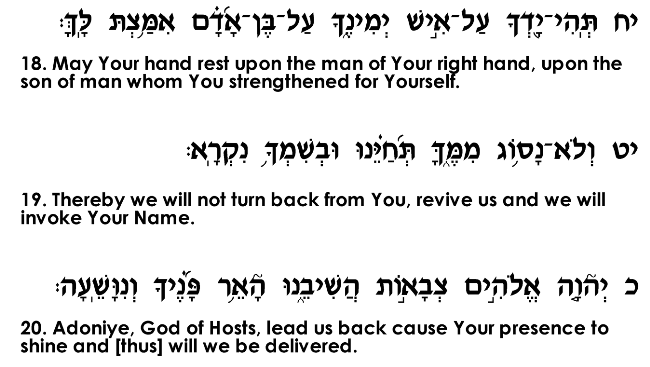 As mentioned, this prayer was clearly composed in reference to the Jewish exile, petitioning God for redemption. Rashi, however, commenting to verse 3, adds that Assaf here also refers to earlier periods in Jewish history when Am Yisrael faced situations of crisis. According to Rashi, Assaf's specific mention of Efrayim, Binyamin and Menasheh in verse 3 addresses situations involving members of these tribes. The mention of Efrayim refers to the war waged by Aram against the Northern Kingdom of Israel during the reign of the wicked king Ahav (Melachim I 20), and the reference to Binyanim alludes to the Purim story, which revolved around Mordekhai, a descendant of Binyamin. 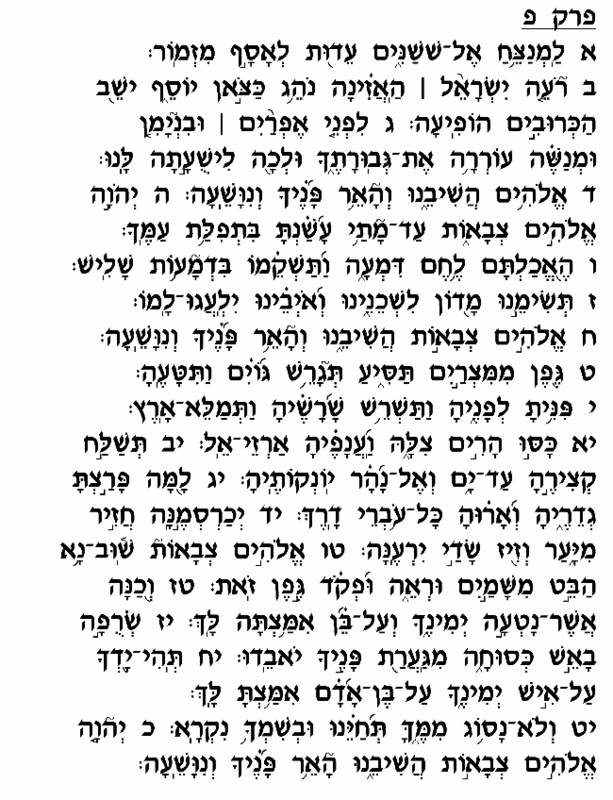 Finally, the reference to Menasheh speaks of Yerovam Ben Yoash, one of the kings of the Northern Kingdom, who belonged to the tribe of Menasheh and during whose reign God delivered Israel from its enemies (Melachim II 14). Assaf – who lived in the time of King David – foresaw that there would be periods when Bene Yisrael would sin and be undeserving of God's protection from their enemies, when He would be forced to "breach the fence" and leave His people exposed to hostile nations. Assaf offers this prayer that God should nevertheless pity His nation and restore them to their previous stature, that at least in the merit of their glorious past He will bless them with security and "fruitfulness" like the large vineyard to which they were compared.